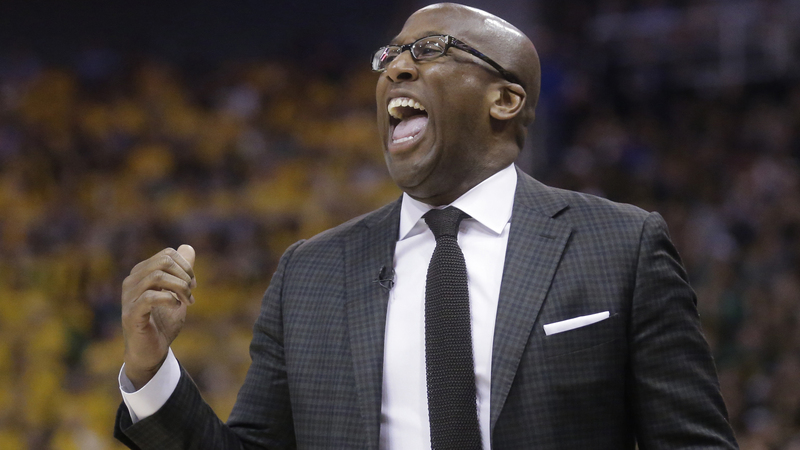 Mike Brown has made countless trips to Salt Lake City as an NBA head coach, assistant coach and now acting head coach of the Golden State Warriors. Every time the 2009 NBA Coach of the Year visits, he inevitably thinks back to 1991, when his brother nearly died in a car accident. 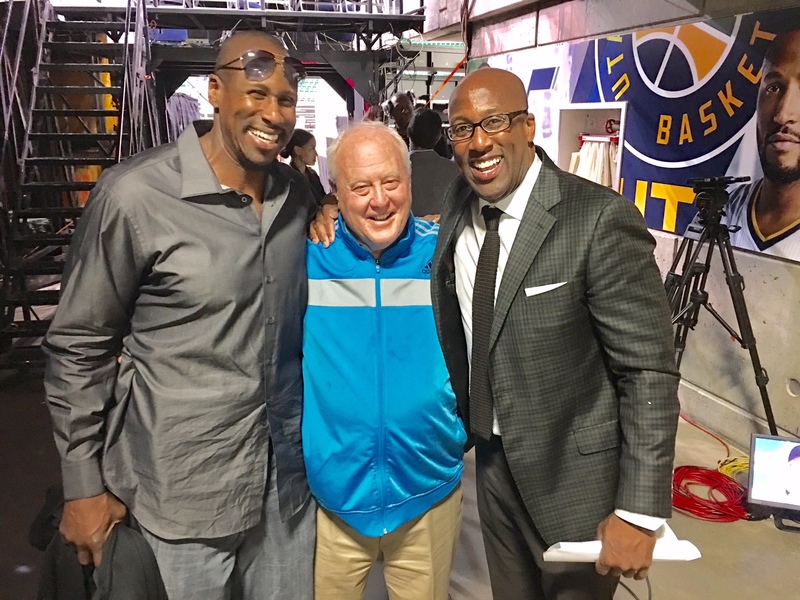 Brown coached the Warriors to a series-clinching 121-95 victory over the Utah Jazz in Game 4 of the Western Conference semifinals on Monday night while his proud brother, former NFL lineman Anthony Brown, sat nearby. “I always think about it, especially if I’m with him,” Mike Brown told The Undefeated. “It’s a funky deal, a weird feeling. I will never forget that. Coming to the airport here after a long flight. I’m a college student and I feel like I was pretty mature. I get the call, and then I’m the first one here knowing he could die any second. Mike, 47, and Anthony, 44, grew up in a military family and spent their teen years at Würzburg American High School in Würzburg, Germany. Mike was a football and basketball star who came back to the United States to play basketball at Mesa Community College in Arizona before accepting a scholarship at the University of San Diego. Anthony was a much better football player who starred as an offensive lineman at Mesa Community College in 1991 before accepting a scholarship to the University of Utah to play for then-head coach Ron McBride. Before Anthony could play a snap for the Utes, he got into a head-on collision on a Salt Lake City highway in the summer of 1991. The 6-foot-5, 315-pounder was in the passenger seat without a seat belt and was thrown from the car. He suffered major head trauma, cuts and bruises. Mike said his brother made the mistake of going with two other guys to a casino at the time of the accident. “I got airlifted to LDS hospital here in Salt Lake,” Anthony said. Mike was in Germany visiting his parents for the summer. He answered the phone when McBride called to share the news of the accident. “That was horrible. That was scary because it’s a bad deal. And he’s hanging out with the wrong guys, too,” McBride told The Undefeated by the Warriors’ locker room after Game 4. McBride asked to speak to Mike’s parents, but Mike said they weren’t home. McBride told Mike that his brother was in a “bad car accident” and he didn’t know whether he would survive. Mike got on a plane from Germany to Salt Lake City to be the first family member at the hospital. He had no idea if his little brother would still be alive after the long plane trip. His parents flew in shortly afterward. (From L-R) Anthony Brown, ex-Utah football coach Ron McBride And Mike Brown. “I walked into the hospital room. He’s a big dude, but he was lifeless, unconscious and hooked up to so many different machines,” Mike said. “The scariest, most depressing thing ever. Mike stayed with his brother in Salt Lake City for the remainder of the summer before returning to San Diego for school. Anthony redshirted the 1991 season for the Utes and had several tests on his head before finally being medically cleared to play the next season. He was worth the wait for Utah, as he was a starter on the offensive line for back-to-back bowl teams in 1993 and 1994. He was first-team All-Western Athletic Conference on one of the nation’s top offensive lines in 1994 and third-team All-America. Mike attended as many games as he could while working his first NBA job with the Denver Nuggets as a video coordinator. The Deseret News in Salt Lake City ranked Anthony as the 38th-best player in Utah football history. He played in the NFL with the Cincinnati Bengals and the Pittsburgh Steelers from 1995-99, appearing in 52 games and starting in 17. “I’ll never forget when I started in Denver, he was a football player at the University of Utah,” Mike said. “I used to hop on Southwest whenever I could and fly back out here to see his games. The biggest thing was after games he was the big man on campus and we’d go out. Even though I was the older brother, he was the one getting me into the bars and stuff like that. Mike compiled a 563-347 record as an NBA head coach with the Cleveland Cavaliers and Los Angeles Lakers from 2005-10 and 2011-14. He coached a young LeBron James and the Cavaliers to the NBA Finals in 2007. Mike, in his first year as Warriors assistant coach, was promoted to acting head coach on April 22 after chronic back pain sidelined head coach Steve Kerr. When Mike endured a scary situation on May 27, 2016, in his suburban Cleveland home, his little brother was there to help out within days. Mike’s son, Cameron, started a grease fire in the kitchen after trying to cook mini pecan pies, according to the San Francisco Chronicle. Mike told his youngest of two sons to get back before the coach grabbed a dishcloth to lift the pan’s hot handle. Mike’s body was engulfed in flames after he slipped on cooking oil that had spilled to the kitchen floor. He went to the emergency room after suffering second- and third-degree burns on his right leg, as well as first- and second-degree burns on his right foot, left leg, arms, hands and face. Anthony came to Cleveland to check on his brother after the traumatic accident. Little brother served as a chauffeur for Mike as he began the healing process. He also drove him to his interview for the Warriors assistant coach job with Kerr and general manager Bob Myers in Cleveland during the 2016 NBA Finals. Mike arrived to the interview bandaged and on crutches. “I took care of him a little bit,” Anthony said. “I didn’t do anything to his bandages or anything like that. I just kind of helped him. I was out there for about three or four days. Golden State Warriors interim head coach Mike Brown shouts to his team in the first half during Game 4 of the NBA basketball second-round playoff series against the Utah Jazz Monday, May 8, 2017, in Salt Lake City. Did little brother even the score from the car accident by going to Cleveland to be with his brother after he was burned? The last time Mike was a full-time head coach in the NBA was during the 2013-14 season with the Cavaliers. He is 6-0 as acting head coach of the Warriors during the playoffs, with two series-clinching victories. With Kerr gone indefinitely, Mike could be the coach for the rest of the playoffs — with a potential Finals rematch against his old Cavaliers. While Mike has received his fair share of criticism as a coach, his brother views him as a winner. “That’s my brother. I Iove him and I will always look up to him. In my eyes, he can do no wrong,” Anthony said. Mike described his relationship with his brother as “extremely close.” A proud Anthony is watching closely and passing on positive messages along the way. Mike said Anthony is his “No. 1 fan” besides their father.